Certificate & Achievements – The Pretty Group journey dates back to the early 2000. 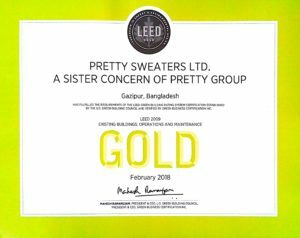 Pretty Group is one of Bangladesh’s foremost private sector companies with a turnover of US $ 110 million. Pretty Group has a diversified presence in Garments manufacturing, Garments Dyeing, Fabricated Steel Manufacturing, Accessories Manufacturing. Pretty Group’s Textile-Business is one of Bangladesh’s largest exporters of Garments Products. 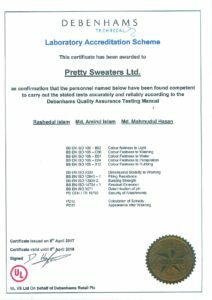 Pretty Group started it’s journey in 2001 with an ISO 9001-2000 certificate and still successfully running it’s business by exporting big volume of garments to Europe, USA & Canadian markets. It has been directly executing business with many reputed Brands like H&M-Sweden, Okaidi-France, Spring Field-Spain, Pimkie-France, Jules-France,Tesco-UK, Auchan- France, Rivers-Australia, Celio SA- France, Ackerman- South Africa, Boyd- Australia, WDI- France etc. 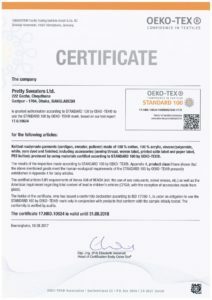 In recognition to minimized risks and occupational hazards in our factories, pretty Group has been certified by various bodies Sedex, BSCI, Oeko-Tex.Pretty Group has also membership of BGMEA, BKMEA, DCCI, BDYEA.